Hello and welcome to the Riverside Guest House. 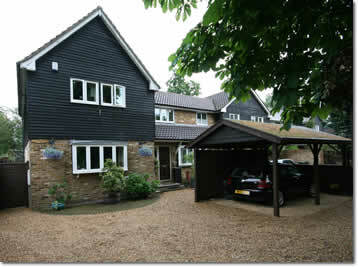 "Riverside" is a non-smoking, 4-Star guesthouse situated in the village of Roydon on the Essex/Hertfordshire borders. We offer clean comfortable spacious accommodation all year round with warm friendly service with all rooms en-suite. As our name suggests, we back directly onto the beautiful River Stort. Please see our detailed pages using the menu above for everything you need for a great stay.